It’s amazing that some of the easiest commands to teach a dog can also be the most useful. Got a begging dog panting in your face? Is your dog about to roll in something nasty in the yard? Did you accidentally drop a pill on the floor but your pup thinks it’s a treat? Don’t worry, the Off command comes to the rescue! It’s similar to the Leave It command so feel free to change the words if you like. Heck, you can call it anything you like, it just means that your dog is supposed to back away from whatever he’s currently interested in. Look how easy it is to teach your dog the Off command. Have your dog sit in front of you while you hold a yummy treat in front of his nose. Allow your dog to sniff the treat, but make sure he can’t grab it. Your dog may paw at it or get a little frustrated while trying to get the treat. Give the verbal command, “Off”. As soon as his nose makes the slightest movement away from your hand, give him the treat and praise. Most dogs figure this out pretty quick, but in the beginning you’ll reward very small movements away from your hand until you see that your dog understands what you’re asking. He may just move his nose slightly down or away from the treat, but that’s what you’re looking for at first. Once your dog “gets it” and consistently makes movements away from your hand with the command, you can slowly increase the distance he moves away by repeating the command or by holding on to the treat a tiny bit longer each time as he slowly increases the amount of distance that he backs up. If you use a clicker for training, simply click when you see your dog’s nose move away from your hand then give your dog the treat and praise. 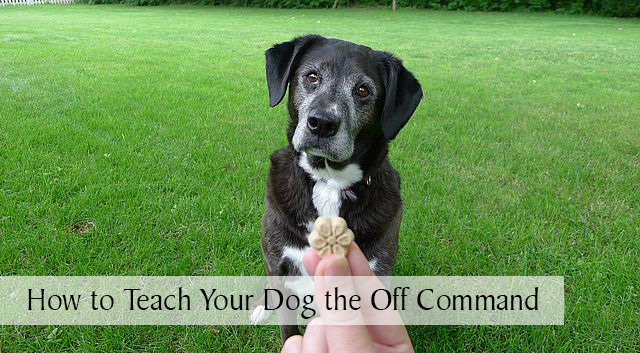 While teaching the Off command, you can also combine it with training the Take It command by saying “Take It” when you give your dog the treat. Once your dog is reliably backing away from you when you give the command, start withholding the treat until your dog makes eye contact, then gradually work to extend the eye contact duration for several seconds. This can strengthen the bond with your dog and help get your dog’s attention when needed. Don’t push your dog away from you or have someone pull them back by using a leash; this will only trigger their opposition reflex. Your dog will learn quickly on his own by timing your rewards when you see movement. While playing with a toy your dog wants, say “Off” and wait until he backs away before giving him the toy and continuing the play. Place a treat on the floor in front of your dog but cover it with your hand. Give the command and if your dog moves away, give him the treat. Use the command if your dog tends to rush the door when going outside. This works well when combined with the Wait command to teach good door manners. Use the command around the house if your pup becomes a little too interested in something that’s off limits, like the kitchen trash can. Challenge your dog by taking treats along with you on your walk and reward him for listening to the Off command when you want him to avoid something undesirable. It’s good to train on things that are only mildly interesting at first, since those undesirable things usually smell rather attractive to dogs. 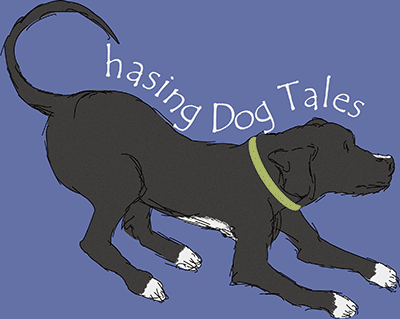 Check out Haley’s video below for three good reasons to teach your dog the Off command. There you have it! It’s easy to train the Off command and it really comes in handy in so many different circumstances. Who knows, it could even save your dog’s life one day! Did you teach your dog the Off command? Tell us when you use it the most and share your tips for training the command. Thanks, Hannah! That’s a great idea to practice with something smelly because it can be pretty challenging to stumble across something on a walk and have your dog respond to the command. We learned the off command easily, but the problem is most humans tell us down rather than off and so we keep jumping until Mom comes by with a firm off. That’s true, I guess it’s a human habit to say “Down” but moms usually know how to get things under control quickly. Leroy knows the off command he just doesn’t use it very often! Love the fruitable treats! That’s what we use as training treats too! I love them too! These are the snowflake version left over from Christmas so I need to use them up. Haley doesn’t mind helping to get rid of them though, lol! I use “off” to mean get off the furniture or dog bed. For past dogs, I’ve also used it to mean don’t jump on me or don’t touch me, but Ace is not a physical dog. He is, however, sometimes sitting too close and drooling on people, so for that I use “back up” which sounds a lot like how you are using “off” in this post. So, we use “back up” and also “leave it” and “drop.” All of these have been so helpful and important in everyday life with my dog. I can’t imagine having a dog that doesn’t know the commands you mentioned. Those simple commands make life so much easier and they’re pretty simple to train too. Maybe I should have called the command “Back Off” for those times when Haley’s panting in my face, haha! Haven’t had to use this command much as neither Jack or Maggie are jumpers or sofa dwellers…”Go Lie Down” is the phrase we use most with Jack as he likes to just sit in front of us. Jack sounds like a lover! I always feel a little guilty when Haley wants to be in my face but she’s hot and panting, but I usually make her lay down and relax for awhile too. I use the command “leave it” but if you read my post today about Jax eating a sock, I can use a whole lot more training time. Love the video, you make it look so easy and obtainable. It’s raining like crazy all day today so I promise you – we will be trying your technique in a few minutes. Thanks so much – I intend to share too! Getting ready to head over and check out this story about Jax! Good luck with the training today, it looks like it’s going to be a rainy day here too. Once you got the basic training down then comes all the fun tricks. This is an important one to know! Thanks for sharing. I’ve kind of slacked off on the tricks lately, I need to get back to teaching Haley some fun things! It sure does come in handy, doesn’t it Jenna? An extremely useful command. Great post! I use off on when I need Mr. N to get off the bed so I can change sheets. And on the rare occasion he jumps on someone. Mostly we use leave it. I know a lot of people use both commands, Off and Leave It. For some reason, Haley usually knows that Off also means to get down off the bed or furniture or not to jump on people. It’s great that you don’t have to worry too much about Rita grabbing things she comes across when walking! Unlike little Miss Haley who once ate an onion ring off the ground at a local fair and then proceeded to have diarrhea on the main walkway which was crowded with people. That’s a tough one to clean up, ugh! Really great tips! Ruby is fairly well behaved, but we still have trouble with the stay command. She has separation anxiety so she sometimes gets nervous and comes to look for us. We are continuing to work on it! Aw, that can be a tough one, especially for Ruby with her separation anxiety. We’re always working on something here that needs a little reinforcing too. Sounds like you use “off” a little different than we do. Ours is mostly for furniture and jumping. We use leave it when something has been dropped and scooch or beep to get them to back up. When we want them to lay and stop begging I just tell them to lie down. It sounds like you have off trained so well that it almost just means freeze! Lol, I had to laugh when you said you use “Beep”, I do that too when Haley’s in my way. I’ve been teaching this command to my 10 month old dog, but we’re not quite there yet. It truly is a command that will keep her safe. Your dog is a master at it and I love how she keeps backing away each time you say it. We’ll keep at it. Enjoyed seeing it on the video too. Thank you, Sharon! I’m sure you dog will master this soon. I remember when Haley was around that age, she wasn’t very reliable on many of the commands we were working on. This is such a great post with very simple explanations! We are about 3 weeks away from our puppy and some things seem very daunting, especially with training. We’ll get it though! 🙂 Thanks for the awesome advice once again, we can’t wait to put it into action! Thanks for sharing this great information about off. Thanks JoAnn, and congratulations again on the beautiful litter of puppies! Great tips. We mostly use “Leave It”. Good tips and similar to the process we used to teach Honey. But I have a tougher question: how do you teach pesky humans to reinforce “off?” Because I feel like we’re always retraining Honey bad things other humans teach her. Lol! The “Others” can be a tough breed to train. They can be stubborn and strong-willed, but I suggest treats of a human nature to reinforce good behavior! Let me know how it works, Pamela and I’ll try it with my “Others” too! Awesome video of Haley obeying the “off” command, especially in the very first situation in your living room! We use the “off” command when we want our pups to get off of a couch or bed or keep them from jumping up on someone, and “leave it” when we want them to get away from something, such as dropped food, pills, etc. Those two commands are invaluable in my humble opinion!! Thanks, Barbara! I agree, those two commands are so useful and both are pretty easy to teach too. It sure makes life easier when they know “Off” and “Leave It”.